Fabric designer Lizzy House is coming to Portland to teach a fabulous Textile Printing and Design class at PNCA this weekend, and PMQG got the chance to catch up with her and ask a little bit about her design life and process. 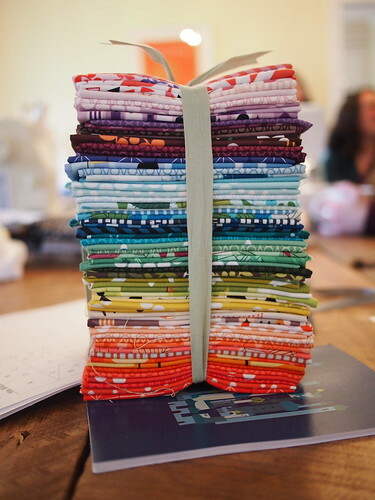 Lizzy is a truly fascinating person (check out her blog for more of a peek at her world) and I love sewing with her fabric, so it was really cool to hear a bit more about what makes her tick creatively! Heather: How did you start designing fabric? What was the beginning process like for you? Lizzy: I started designing fabric because when I was six or seven I decided that I didn't like anything that was available, so I asked my mom how the designs came to be on the fabric. She told me that someone drew it. I then told her I would take over the world. I was, again, six or seven. I started professionally designing when I was 21. It was literally always something that I was working towards, and thinking about. People my own age thought I was crazy town when I told them that I would design fabric. Then I would have a maniacal moment to myself when I knew I would rue the day. I'm feeling super hero-ish this morning. The design process for me usually involves travel. That's just how I get a lot of my ideas, and it's great because I travel a lot. It all works. When I know that I need to produce a new collection, I will start working really intensely for about 2 weeks. Literally just drawing/ writing down every thought no matter how wild or odd, until something starts to rise from it. And it usually does around the middle of the second week. Images and ideas start to set themselves apart, and that's typically how most of my lines start. Those two weeks get a little unkempt. It's like my apartment explodes. Petra: With the boom of digital fabric design and new fabric designers, where do you see the industry headed in the next 5 or 10 years? I definitely see the industry changing, but mostly the pace of things. 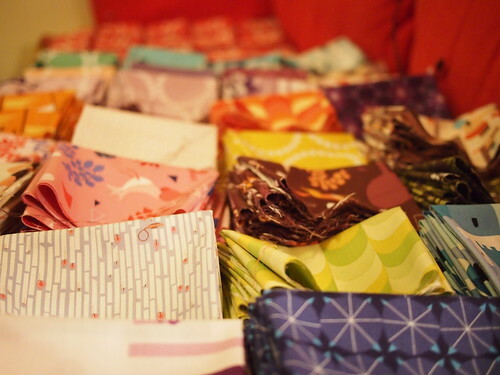 There is so much that has become instantly available, and I think that has changed the way people think about buying/collecting/using their own fabric. It's like an insatiable appetite. Also the rapidity at which collections are being released now seems dangerously fast to me. I don't see exactly how this is going to pan out, or if it will ever slow down again... but things are definitely changing. I see previews for movies now and I can hardly watch because they are all so intense or in 3D... it's like everything has become so extreme, and it feels like the textile industry is falling into a similar formation. So where does it go when you are on the road to full speed? Susan: Your fabric designs are always so striking, from spoons to peeps to pennants, but I love how you've included new colorways of Pearl Bracelet in all your recent collections. That's my favorite print and I'd love to hear a little more about what inspired it... hoping to keep seeing it as you create new lines. Lizzy: The idea for Pearl Bracelet comes from the basic idea of Red Letter Day, the collection from which it originated. Which is, taking ordinary things or experiences and making them special. An ugly duckling who loves his life because he has no idea he is odd. An unexpected walk in the woods that turns into the best part of your trip. A prize ribbon that made you feel like a winner. Stripes to know that you did it. And of course the Pearl Bracelet. The idea of a gift from someone that you know loves you more than you could measure. So it thrills me that people love it, and I am so excited for the initial collection of them to be released. There will be 30 total: including the ones that are currently available from 1001 Peeps, Outfoxed, and Hello Pilgrim, as well as the original blue pb. I'm working on some neutrals as well as just some fantastic colors that will fill in your rainbows. So I am super psyched about it. It's always cool when something that means a lot to you, means a lot to other people too. imagine a pennant strand five times this long in 30 different colors! New stuff! I'm developing some products that I am so excited about, and that's pretty much all I can say. 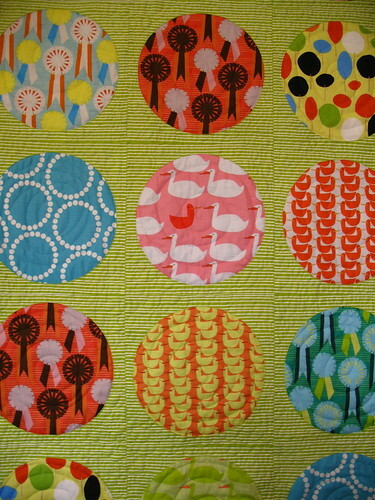 Oh, and of course there is new fabric that will be shown at Spring Market that I am so excited about too. Thanks so much to Lizzy for the interview - I can't wait to see the new collection and all thirty (!) colors of Pearl Bracelet! Her class, Textile Printing and Design, still has just a couple spaces left, if you are free this weekend and looking to learn amazing things. (And don't forget, thanks to their generous sponsorship, guild members get 10% off any one PNCA class.) 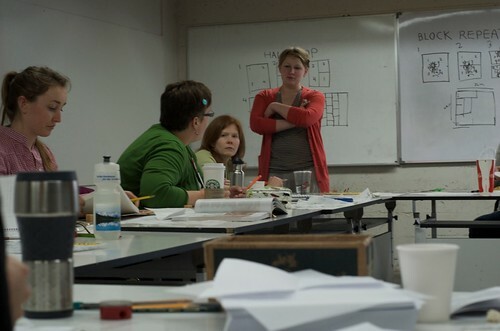 Petra, who's taking Lizzy's class, will post all about it next week!